Stay-at-home fathers are more visible these days. Among U.S. fathers who are married or living with a partner, about 6% are homemakers, according to analyses in a recent Pew Research Center report I coauthored. Stay-at-home dads are much less common than stay-at-home mothers, who make up about 30% of mothers with a spouse or partner. Stay-at-home dads are definitely the most involved dads. The amount of time they spent taking care of children and doing housework is the most of all fathers. They also do more at home than their partners who work for pay, which is an exception in two-parent families (see numbers in the table below). These findings are based on time diary data. Let’s look at the numbers in another way: On a weekly basis, stay-at-home fathers spend an average of 33 hours doing housework and childcare, but 43 hours in leisure. Their leisure time is more than their work time. What does this mean? Do dads just want to have fun when they stay at home? Or Stay-at-home dads are lazy dads? Things maybe a little bit more complicated than this. Compared with fathers who work for pay, stay-at-home fathers are slightly older (their average age is 41), less likely to be white (45% non-white) and less likely to be college-educated (19% with a college degree). To some fathers, staying at home might be a choice, and to others, it may be not. It is safe to say that not all stay-at-home dads decided to quit their high-paying job and be a full-time homemaker. So what is it like to be a stay-at-home dad? I happen to know a couple who just had a baby last year, the wife was working full time and the husband’s job wasn’t stable. So when the baby was born, they decided to have the husband stay at home, saving childcare costs. Haha, it seems that men surely can do what women do. My friends’ husband is working hard at home, I know he is. Categories: Family, Fatherhood, Time Use | Tags: Father's Day, Fathers, Parenting, Stay-at-home dad | Permalink. Americans are delaying marriage. The age at first marriage currently stands for 27 for women and 29 for men, according to the Census data presented in a recent report called “Knot Yet”. The report includes a lot of interesting findings about the benefits and the costs associated with delayed marriage. I tend to pay attention to details, when I get to Figure 7 and 15 (see below), some interesting patterns caught my eye: Never married women and never married men seem to be very different economically —judging by how well they are doing in comparison with their married peers. 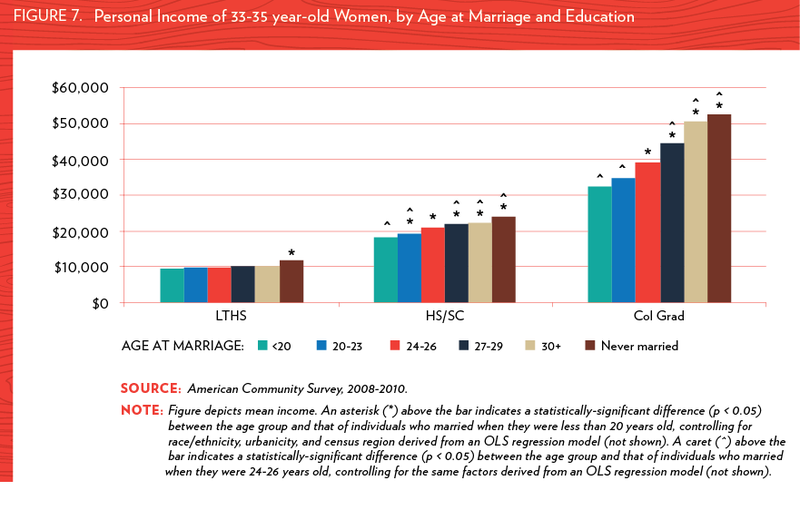 Among women in their mid-30s, those who have never married make more money than do married women. This is true at every education level. College educated single women have the highest personal income among this group of women, on average they make slightly over $50,000 per year.These findings have been adjusted by race/ethnicity, urbanity and region. On the other hand, the earning power of never married men in their mid-30s is weaker than that of their peers who are married. In fact, they consistently make less money than married men, at almost every education level. What does this tell us? 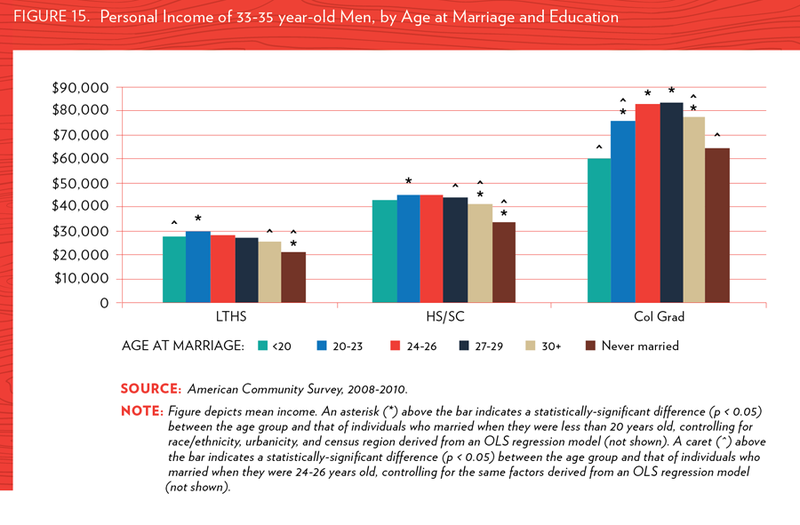 If income is a measure of success (not to say it is a good measure), the marriage market for those who wait until their mid-30s is largely made up with economically successful women and less successful men (Divorced and widowed adults are also on the market, although they are much less likely than those who have never married to say they want to get married, according to a report from the Pew Research Center). Now it seems that some common complaints from single women are actually not far from the truth, such as “hard to find a quality man” or “all the nice (and successful) guys are married.” Sadly, now we have some evidence to back them up. It is not clear whether the highly paid men are more likely to get married or because of the marriage (as well as a supporting spouse), men increase their earning power. Both could be true. In fact, research has shown evidence supporting the relationship of each direction. The challenge is that we will never know if the same group of men chose not to marry, what their earnings would be. Another “news” that got confirmed in these data is that men on average still make more money than women, even when they are both single in their mid 30s and both college educated (the gap is approximately $10,000 per year). Categories: Family, Marriage | Tags: marriage, Relationships, Single Ladies, United States | Permalink.